The aim of a Regional Innovation Strategy (RIS) project is to develop an innovation strategy which, by taking into account the specific conditions of the region it covers, contributes to enhancing the region’s innovation capabilities and competitiveness. In order for this to happen, the strategy needs to have political and institutional backing for its implementation, and be accompanied by an action plan with concrete measures to be launched in the region. Stage 2 – Strategy definition, evaluation, monitoring and implementation mechanisms, pilot projects. In order to have successful outcomes of the project, the RIS project management needs to orient each stage and each activity so that they contribute to the final objective – the development of an innovation strategy that can make a difference in the region. The methodology of Stage 0 of RIS DISCOVER NE ROMANIA followed the basic guidelines of the IRE RIS “Methodological Guide Stage 0” edited by IRE Network, adapted to the specific needs of the North-East Region. A particular attention was given to identify the need to concentrate the statistical data existing at level of the region, according to the figures authorised by the National Institute for Statistics in 2004, that was confronted with collecting analyses studies and researches developed in the field of SMEs at national an regional level (White Chart for SMEs 2005 edition), or in the field of research Romanian White Paper on Innovation (edition 2005) or in the field of regional development National Plan for Development 2004-2006, as well as North-East Regional Development Plan 2007-2013. Due to the particular situation of Romania in the project implementation period 2005-2008, (phasing out pre-accession and transition to accession funds), references were collected also in terms of operational programs issued by Romanian Government for 2007-2013 programming period, particularly in the field of competitiveness, human resources, regional development and cross border cooperation. The full version of this methodology is attached below. 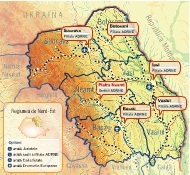 Before 2002 there weren’t any effective consultation mechanism in Romania’s North-East Region. North-East Regional Development Agency was the first regional body that initiated and supported the setting up of two main regional consultation mechanisms dealing with socio-economic development issues.